Though there is no official membership nor registry of members, the community was described as having an attendance of anywhere from 50 to 300 attendants, dependent on weather, festival, and time of year (auspicious etc.). Regular Sunday worship service attendance is between 30-70 people. Ethnic Composition: Predominantly Caribbean and West Indian Hindus. Small pockets of Mercian, African-American, Caucasian, and Indians also regularly attend services. An easy example of the diversity in the ethnic composition of the temple are the Pundit and his wife, the former is originally from Guyana, and the latter from India. The Hindu Devotional Society is not affiliated to any other organization or bureaucratic body. 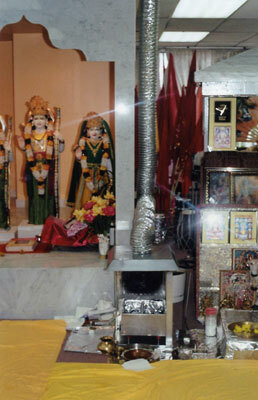 Within the Montreal area, however, the Temple executive maintains an open-door policy to all Hindus and open communication lines with all Hindu temples. As the Temple is run independently from any other organization, all activity and festival scheduling follows the Hindu calendar for its holy days. 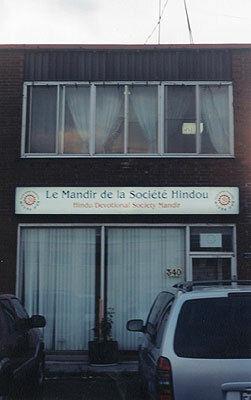 The name of the organization, "The Hindu Devotional Society," was registered in Montreal in 1979. At that time there were a number of Hindu Temples and aspiring congregations competing for membership and each appealing to slightly different demographic groups. For the first 6 years of its existence, the Society worshipped once a week in a rented room at the YMCA on Drummond Street. In 1985, Punditji Ramanarine began the process of acquiring a temple. He appealed to the Quebec Government for the free use of a schoolroom at one of their COFI education centres. COFI is a programme run by the Quebec government to teach French to new immigrants and the programme is housed in a number of different schools throughout the Montreal area. The request was eventually granted and for the next 8 years the Society met at a COFI schoolroom, changing locations about once every six months. As the society no longer needed to pay for a worship space, Punditji Ramanarine began the process of acquiring funds for the purchase of a temple. Over the next 8 years he would patiently collect all the funds he could as well as contribute some of his own money to pay for the purchase of a temple. In September, 1993, the Temple building was purchased. 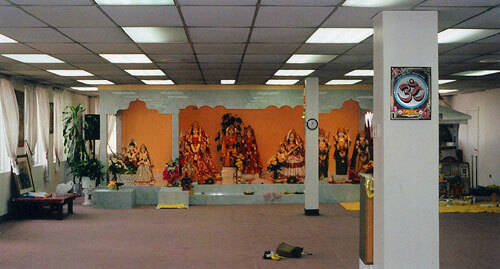 After renovations and having rented out the bottom space to a Karate Dojo, the Hindu Devotional Society Mandir had its official opening on January 8, 1994. Regarding the challenges and problems faced by the congregation in its pledge to build a temple, Punditji Ramanarine explained "No problem is insurmountable, because if one knows the problem it is already half-solved. The greatness of a man lies not in never falling, but rising every time he falls." In short the combination of faith, religious strength, and communal strength keeps the congregation focused on the goal of worship and on the improvement of the temple and not on the problems and costs of maintaining such a venture. Predominantly West Indies and Caribbean Hindus, some present generation immigrants, and some second generation Canadians. The language most commonly spoken among the practitioners is English, though a few speak Hindi. The age group of the congregation is spread from young children to those in their early eighties. At the Sunday service that I attended, there were 20 adults, 5 teenagers, and 9 children. The building, pictured below, has a large lighted sign demarcating it, and is visible from the street. It is a two-story red brick building with the Kitchen/eating area on the ground floor and the temple directly above it. Other than the sign telling that the building is a temple, there is no other ornamentation on the façade. The ground floor is split between the temple's kitchen and eating area and the karate dojo. Upstairs there is a shoe rack to greet you, down the hall to your right is the prayer room, and past the prayer room, the next door on your right is the preparation room, pictured below, and conference room. 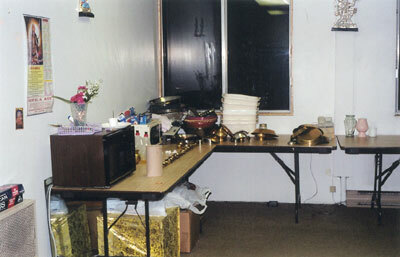 Across the hall from the prayer room is a washroom and to the left of the conference room is a small kitchen. Inside the prayer room (pictured below) the walls are lined with portraits of various deities in situations from traditional Hindu stories. The altar at the far end of the room is made of marble and rises approximately one foot above the floor. The altar is twelve feet wide and six feet long. Upon it stand a variety of deities in lavish clothing, paired or grouped by their spousal relation or by the story in which they appear. From left to right the figures are: a Shiva Lingam and Nandi Shiva's bull on the small altar to the front left corner of the main shrine. Shiva and Parvati are immediately behind the small altar. 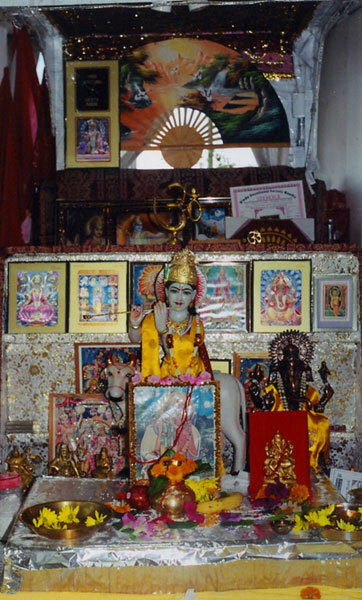 Next on the small altar to the right of Parvati is Hanuman and a small Mother Durga in her own shrine. Ganesha stands to the right rear of that shrine and behind him stands a larger Mother Durga. 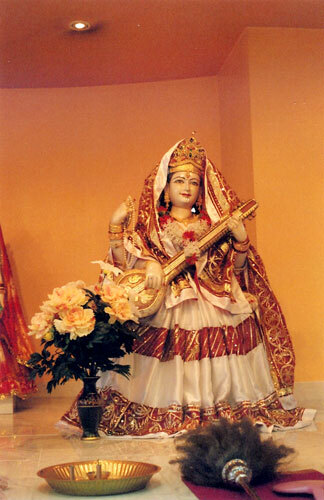 In the middle of the shrine are Krishna and Radha and to the right of them is Mother Saraswati (pictured below). 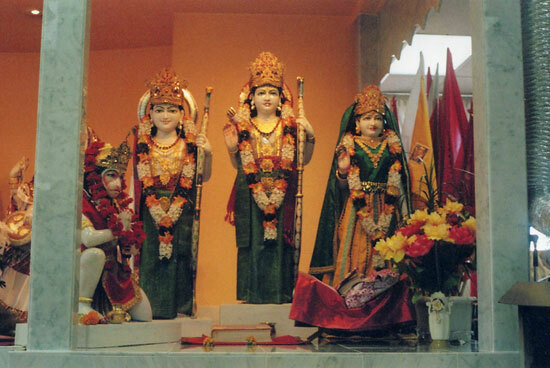 To the farthest right (pictured below), stands Lord Rama the seventh incarnation of Lord Vishnu, Sita is Lord Rama's consort; Lakshmana is Lord Rama's half brother; Hanuman, a great devotee of Lord Rama (also known as Ram Dar Bar): Hanuman, Lakshmana, Rama and Sita. To the right of the main altar there is a small ventilated aluminum altar for fire sacrifices (pictured below), and to the right of that another altar/podium (pictured below). At this last altar there is a bench and lectern for use by the pundit during a service, or by a lecturer during one of the many guest lectures or discussion groups. The small altar in front of the pundit's seating area is for oblations during the services so as not to soil the marble altar. There are open prayer times twice daily, 6 days a week at 06:00 a.m. and at sunset. Though these prayer sessions are not formally organized, people are welcome to come in before and after work to pray and Punditji Ramanarine is present any time the temple is open. Monday mornings there is a special puja to Lord Shiva involving bathing (abhishekam) the image, which sometimes includes anointing it with milk and honey and offering food to the image (Prasad). Tuesday mornings the Ramayan is read and Tuesday evenings the Hanuman Chalisa is read. On Wednesday evenings from 18:30-20:00 there is a youth group comprised of children aged approximately 6-12 who meet to learn hymns, stories form the Ramayan, and other popular Hindu religious texts. Sunday prayer services are held from 10:30-12:30 and are followed by a hot meal prashad, which is supplied by a member of the community. The responsibility for the food alternates on a voluntary basis within the community. In the event that a day has not been sponsored, food is provided by the committee management. During the Sunday service a prayer booklet is available complete with transliteration and translation of the day's prayers. All prayers are performed in Sanskrit and all translations and transliterations are done by Punditji Ramanarine. The booklet changes every six months in order to provide new prayers for the worshippers to follow and learn. Donations are also accepted on Sundays and at all prayer-times. Punditji Ramanarine, who comes from a long line of priests (his grandfather, father and brother), believes that a priest should not be a priest for money, but must be financially independent prior to his ordination and throughout his service to the community. As such, all donations stay in the temple and are put to use for the temple. Neither the committee nor the priest receives any monetary subsidies from the donations. Festivals for each of the deities are also honoured and celebrated. These include Shivrati (a celebration for Lord Shiva, Holi, Ramnami (a celebration for Sri Ram), Nav Ratra (a celebration for Mother Durga), Janmashtmi (a celebration in honor of Lord Krishna's 'birth' or incarnation and Diwali (a celebration for Mother Lakshmi; more commonly known as 'the festival of lights'. Twice annually, once in the spring and once in the fall, a 7-day yajna is held. Usually a yajna is a fire ritual, but in this case though a fire is lit the focus is on recitation and lecture. For 7 nights a guest priest (or sometimes Punditji Ramanarine himself) reads and explains a holy text. The text is selected by the management committee and every effort is made to provide a text that is suited to the specialization of the guest priest. All costs for travel, housing and board are provided for the guests by the temple. Previous guests have included priests from London, Ontario; London, England; Trinidad; Ohio; and most notably the Vice President of Guyana in 2001.